It’s a phrase many of us are familiar with as traders…”exploit your edge.” Sounds kinda like a cross between something illegal and something exciting, right? At the heart of the phrase though, is simply the idea of finding something that works in your trading, and then using it repeatedly to profit over time. Poker professionals do it, and they can calculate with precision what their odds of winning a hand will be based on the cards they’re holding. 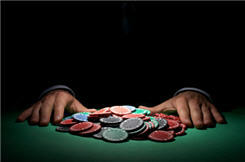 That ‘data’ helps them make critical decisions on whether to fold or bet. Acting appropriately on their ‘edge’ will serve to not only keep them at the table, but help them win. Professional traders aren’t any different – only the scene is. Traders must also know their edge and use it in their decision-making process on a daily basis. Hold or fold? Lighten and tighten? Add to the position? It all depends, but it’s no guessing game for a veteran trader. Amateurs, by contrast, fail to recognize this. They pay for it, too. Operating on hunches, rumors, and generally utilizing the buy-and-hope “strategy” might occasionally result in some winning trades, but confusion and frustration are the most common effects. Amateurs don’t understand what their edge is, and therefore don’t know how to exploit it to their benefit. I’m big on evaluating trading performance  in order to see what can be learned. Sometimes it’s something new, other times it might simply be a reminder of an important lesson. You don’t have to ‘win big’ to win big. Too often, traders think they need to hit home runs in order to come out on top. Matter of fact, some of them are right, but it’s only because they need to overcome  some enormous losses . The truth is that in trading, hitting singles  and occasional doubles can put you in the proverbial ‘Hall of Fame’ as those gains add up consistently. It’s not necessarily easy, but it is pretty simple and far more feasible than trying to nail down the rare home run. Just exploit your edge and watch your profits stack up…you’ll be amazed at what it turns into. As I’ve noted here before, amateurs allow their losses to become too large. But what’s really interesting here is that it isn’t because they’re wrong more often. They’re simply wrong bigger. Amateurs don’t lose small . That’s a grave mistake in this game, and you can’t afford it if you want to last and profit consistently as a trader. Set up some trading rules  if you need to, or put a safety net  in place, but for goodness sake, just stop it ! When you know you’re wrong, exit and look for a new entry. It’s money you’re trying to gain here, not pride. There’s no getting around it – at times you’re going to be red hot and other times you’re ice cold. Personally, there have been stretches where I took hit after hit, simply being out of sync with the price action, but there have also been times when I consistently  turned profits . Every single trader encounters that – pros and amateurs alike – but what matters most is how it’s handled. The amateur fights harder, increases frequency and size, and hopes that just a couple trades will make it all back. The pro takes a different approach. When I found myself in a funk, I reduced my size accordingly, became more selective, and remained patient. Soon enough, I found myself back in sync with the market’s rhythm, and I was back on track. So, step up your game if need be, but figure out what your edge is. Only then will you maximize it to your advantage.